← Tip for Buyers – Don’t Wait! northeast of Hayward. This condo was part of Revelle’s Resort, a popular resort located on over 8 acres of scenic land along the southeast shores of Nelson Lake. Nelson Lake was formed by damming the Totogatic River, which created a large lake of over 2,500 acres, and a watershed area of over 34,000 acres. For more info visit the Nelson Lake Association and the Nelson Lake Resort Owners Association. When I drove in to Revelle’s Resort, I first noticed the beautiful panoramic lake view from this bay. 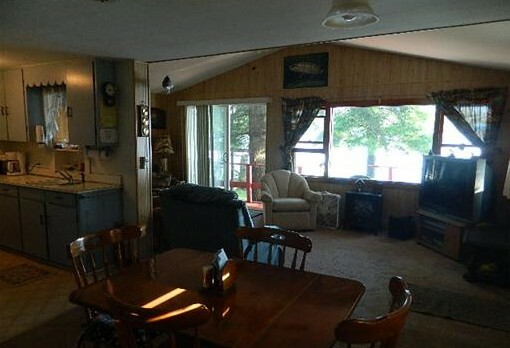 My listing, Cabin #4, is right on the lake, with a gently sloping lot right up to the water’s edge. Inside I found a cute 3-season cabin, and although it is listed as only being approximately 620 square feet, it felt very spacious and open! The sunny living room overlooks the lake for a most relaxing view, which can also be enjoyed from the large wood deck off the living room. There is a separate dining area, and a galley-style kitchen with appliances and ample cabinet space. 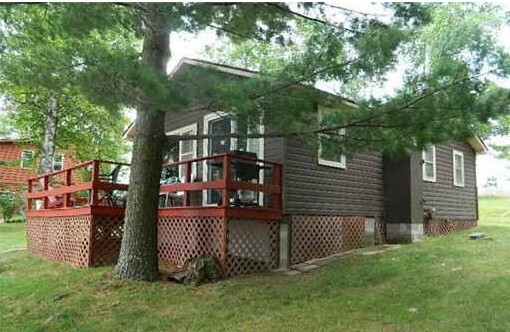 Towards the rear of the cabin are two bedrooms and one bath. Everything one needs for a tranquil summer is right here. 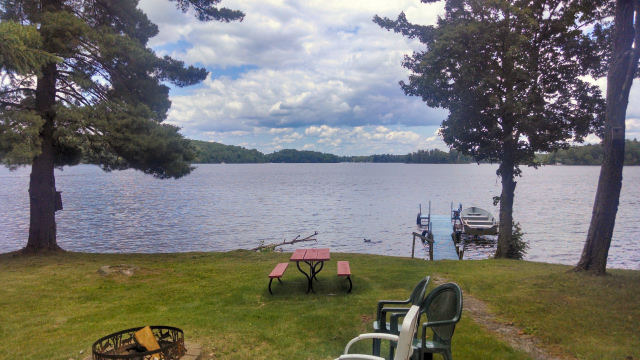 Outside there is a handy storage shed to keep the overflow of ‘stuff’ one accumulates for seasonal lake enjoyment. 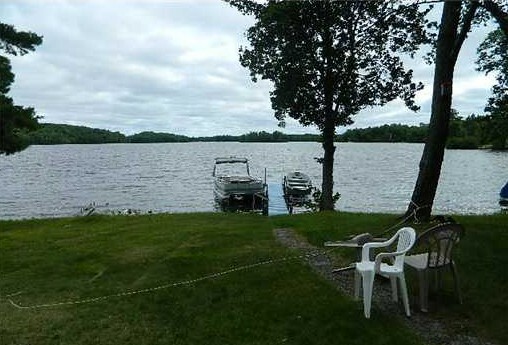 According to the listing, the dock is included with the purchase of this cabin, so bring your boat along! The yard, with its towering, mature trees and the well-groomed lakeshore areas, looks very welcoming to me, I could easily picture myself sitting there, in a comfy lounge chair, a cool glass of lemonade in one hand, mesmerized by the sound of the water splashing up on shore. The resort is only a short walk away so I stopped in to see Bob Revelle and to ask more about the condo association and resort. What a fun place for a visit! The year-round lodge attracts fisherman, vacationers and snowmobilers alike, and is uniquely-decorated with many trophy fish from out of Nelson Lake. The resort offers visitors and guests bait, gas, ice, groceries and other essential items. Bob kept me entertained with colorful stories about the resort and Nelson Lake history, and the friends they’ve made throughout the years. Condo dues are only about $250/year, paid annually. Wow, that is only a little more than $20/mo which covers common and limited common area maintenance and trash removal, and liability insurance for the common elements. Each cabin is separately metered for LP and electric, utilities each owner pays for. The individual cabin owners don’t have to worry about keeping an LP tank filled – the resort keeps their large LP tanks filled and each cabin feeds off their tanks. 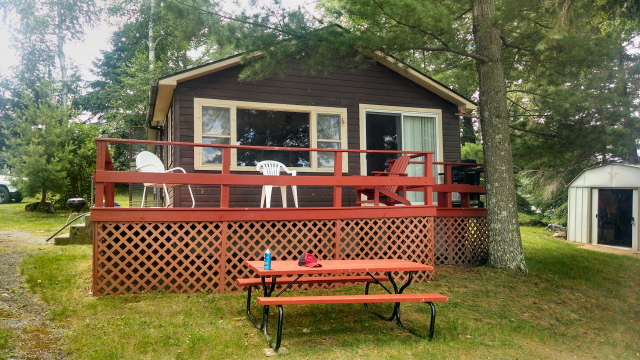 Another great feature is that cabin owners can rent out their cabins for extra income! I was told by Bob Revelle that each owner can take care of that on their own if they wish, or Revelle’s Resort can do it for a reasonable split on the income generated by each rental. They will handle the rentals, check-in, check-out and make sure the cabin is cleaned afterwards. How convenient is that!? My seller really likes this setup – he claims the rental income more than pays for his cabin expenses, and he still gets to enjoy it too. This place is worthy of your visit and consideration! Where else can you get the ambiance of lake living for such an affordable price? Contact me if you’d like more information or want to stop by when you are in the area! This entry was posted in Cabins For Sale Hayward, Condos For Sale Hayward, FEATURED PROPERTIES, waterfront cabins, waterfront condos and tagged area north realty, cabin condo for sale in hayward, cabin for sale hayward, cathy lareau, Condominium, Hayward, Hayward Wisconsin, Lake, lakeside home for sale, nelson lake, nelson lake cabin for sale, nelson lake condo for sale, Resort, revelle's resort, totogatic river. Bookmark the permalink.